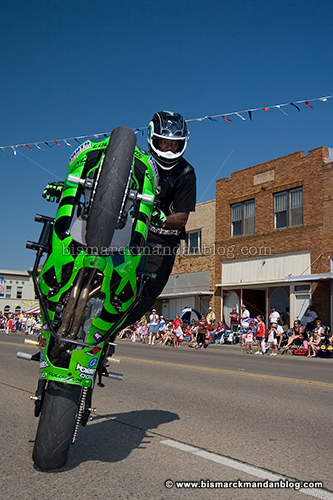 The folks at KTM Cycle Hutt in Mandan gave the community a treat by inviting Jason Britton of the Speed Channel program “Superbikes” to perform and hang out with the Cycle Hutt gang for July 4th last year. He and his friend Tony rode in the parade, gave multiple shows at Cycle Hutt, trained some local stunters, and took in everything Mandan has to offer on Independence Day. He even tried his hand at bull riding at the rodeo! I was hired to follow and photograph the craziness, including riding on the parade float. It was an incredible blast, and I’m so grateful to Justin and Tammy for everything they did for me and the rest of the community that weekend. Now you can see how Jason and the Speed Channel crew enjoyed their time in Bismarck-Mandan! The program is available on iTunes by clicking here or by searching for Super Bikes” in your iTunes browser. It’s $1.99 for the episode. Yeah, my ugly mug appears in there a little bit, but it’s still an entertaining episode. This entry was posted in Events, Holidays, Media, Motorcycles by Clint. Bookmark the permalink.